Thirty-six-year-old JB lives to inspire the old folks at Whispering Pines Rest Home. He listens to their stories, encourages them to get some fresh air, and makes sure they aren’t just sitting around waiting for the end to come. But he’s not a doctor, not a therapist. He’s a resident of Whispering Pines, too. Unfortunately, not every good situation can last. When the finances for Whispering Pines hit the skids, the Home starts to earn the wrong kind of attention. And JB is left to confront the harsh reality of his past, and the reason he dropped out of life to retire three decades too soon. A reality he has been working hard to avoid since stepping foot inside Whispering Pines. I’m really happy with how this screenplay turned out — it’s funny, it’s heartbreaking, it’s quirky and hopefully totally unique. I love the characters and the themes they stand for, and the issues of race, age, life, and more are the issues I’m always writing about and exploring. 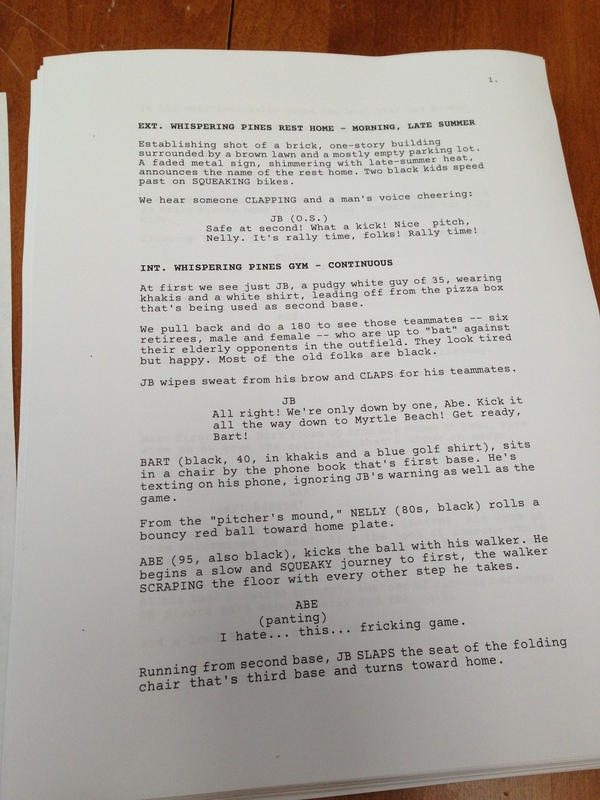 And now that I’ve written this screenplay… I’ve kind of got the urge to write some more. I love the fast pace, the focus on dialog and action. So my next project is already waiting on my desk for me. I’m going to turn one of my novels into a screenplay, just to try my hand at adaptation. It’s the novel that I think would make an awesome film: The All Nation Team.